McKenzie Johnston led the way with 18 points, but it was a complete team effort that allowed Montana to pull away from Northern Arizona and open its Big Sky Conference schedule with a 78-62 victory over the Lumberjacks on Saturday afternoon at Dahlberg Arena. 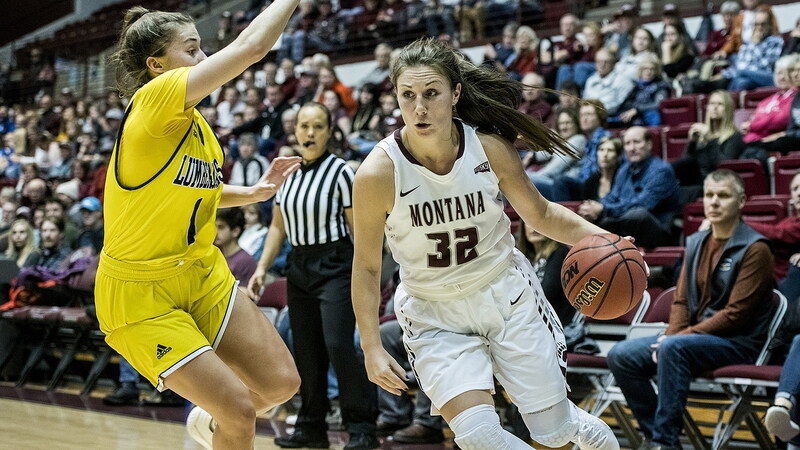 Jace Henderson had her second double-double of the season, the seventh of her career, with 11 points and 11 rebounds, Taylor Goligoski scored nine of her 11 points in the second half to keep the Lady Griz out of reach, and Sammy Fatkin looked like a veteran in her official debut in a Montana uniform. And those highlights don’t include Emma Stockholm, who neared a double-double, with nine points and nine rebounds, and saved her most impressive stats for the defensive play that doesn’t get recorded in the box score but can change a game’s momentum as much as a well-timed 3-pointer at the other end. All in all, a nice way to kick off the 20-game league schedule. “It was exciting to get a lead in this one and show some maturity down the stretch,” said coach Shannon Schweyen, whose team led 38-27 at the half and by eight points or more the entire second half. Just like last season, when Montana opened league with an overtime home win over the Lumberjacks, the Lady Griz struggled to contain Northern Arizona in the early going. NAU went 6 for 13 in the opening quarter, hitting three 3-pointers, and held a pair of five-point leads. That got mostly resolved, but then another issue came to light: Montana couldn’t keep Northern Arizona off the offensive boards. The Lumberjacks grabbed nine of their 18 offensive rebounds in the second quarter. What saved Montana — and allowed the Lady Griz to take a 38-27 lead to the half — was NAU’s shooting. They were just 3 for 18 in the second quarter. Northern Arizona actually scored the first five points of the second quarter, but it would be all Montana after that. The Lady Griz outscored the Lumberjacks 18-3 the final nine minutes of the first half to take control. Everything was clicking, on both ends. It was when Fatkin, a transfer from Arizona, showed everything she can do for her new team. She scored it, she distributed it, she stole it. And she opened up a world in which not everything has to go through Johnston’s hands, and that’s a good thing. Fatkin finished with seven points, four assists and three steals in 18 minutes. Montana played mostly zone against Northern Arizona, and that allowed Stockholm to position herself right in the heart of the key time and time again, when Lumberjacks came barreling toward the basket. One of the game’s takeaway memories: Stockholm lying on the floor, the crowd responding with its approval for another charge drawn. Momentum: Montana. Frustration: Northern Arizona. “Emma was huge today,” said Schweyen. “The light’s really come on for her about how to take a charge. Gogligoski was hardly noticeable in the seven minutes she played in the first half. And that’s not a knock on her. Instead it highlights the depth that Schweyen has on her team for the first time in her three years as head coach. Goligoski had two points in the first half and Montana still led by 11 at the break. It’s becoming a team for opportunists, for players to take what they can when their moment arrives. Goligoski’s time would come. And things may have gotten a little tense had she not asserted herself in the second half. She went 4 for 5, with an explosive drive to the basket in the third quarter after Northern Arizona had cut it to eight and a 3-pointer in the fourth quarter that ended NAU’s hopes of a comeback. “She had a bunch of big buckets in the second half. She made the most of her minutes and had a great game,” said Schweyen. Abby Anderson hit both of her shots and had a pair of blocks, Carmen Gfeller went 3 for 4 to join Fatkin with seven points off the bench, and Jordyn Schweyen hit a 3-pointer late in the game. Montana shot 40 percent or better all four quarters and ended up at 47.1 percent for the game. It improved the Lady Griz to 6-0 this season when shooting better than 40 percent. Montana (6-4, 1-0 BSC) will host Southern Utah (3-7, 0-1 BSC) on Monday at 2 p.m. The Thunderbirds lost 69-64 at Montana State on Saturday, nearly rallying back from a 16-point third-quarter deficit.